"Super Sabre" redirects here. For the comic book character, see Super Sabre (comics). The underside of the first of two YF-100A prototypes, s/n 52-5754. The North American F-100 Super Sabre is an American supersonic jet fighter aircraft that served with the United States Air Force (USAF) from 1954 to 1971 and with the Air National Guard (ANG) until 1979. The first of the Century Series of USAF jet fighters, it was the first USAF fighter capable of supersonic speed in level flight. The F-100 was designed by North American Aviation as a higher performance follow-on to the F-86 Sabre air superiority fighter. Adapted as a fighter-bomber, the F-100 was supplanted by the Mach two-class F-105 Thunderchief for strike missions over North Vietnam. The F-100 flew extensively over South Vietnam as the air force's primary close air support jet until being replaced by the more efficient subsonic LTV A-7 Corsair II. The F-100 also served in other NATO air forces and with other U.S. allies. In its later life, it was often referred to as the Hun, a shortened version of "one hundred". The YF-100A first flew on 25 May 1953, seven months ahead of schedule. It reached Mach 1.04 in spite of being fitted with a de-rated XJ57-P-7 engine. The second prototype flew on 14 October 1953, followed by the first production F-100A on 9 October 1953. The USAF operational evaluation from November 1953 to December 1955 found the new fighter to have superior performance, but declared it not ready for wide-scale deployment due to various deficiencies in the design. These findings were subsequently confirmed during "Project Hot Rod" operational suitability tests. Six F-100s arrived at the Air Proving Ground Command, Eglin Air Force Base in August 1954. The Air Force Operational Test Center was scheduled to use four of the fighters in operational suitability tests and the other two were to undergo armament tests by the Air Force Armament Center. The Tactical Air Division of AFOTC was conducting the APGC testing under the direction of project office Lieutenant Colonel Henry W. Brown. Initial testing was completed by APGC personnel at Edwards Air Force Base. Particularly troubling was the yaw instability in certain regimes of flight which produced inertia coupling. The aircraft could develop a sudden yaw and roll which would happen too fast for the pilot to correct and would quickly over-stress the aircraft structure to disintegration. It was under these conditions that North American's chief test pilot, George Welch, was killed while dive testing an early-production F-100A (s/n 52-5764) on 12 October 1954. Another control problem stemmed from handling characteristics of the swept wing at high angles of attack. As the aircraft approached stall speeds, loss of lift on the tips of the wings caused a violent pitch-up. This particular phenomenon (which could easily be fatal at low altitude where there was insufficient time to recover) became known as the "Sabre dance". The North American F-107 was a follow-on Mach 2 development of the F-100 with the air intake moved above and behind the cockpit. It was not produced in favor of the Republic F-105 Thunderchief. North American RF-100A-10-NA Super Sabre 53-1551. Used by Detachment 1 of 7407th Support Sqn of 7499th Support Group. Crashed near Neidenbach, West Germany Oct 1, 1956. Pilot ejected safely. North American received a contract to modify six F-100As to RF-100As carrying five cameras, three Fairchild K-17 cameras (see Fairchild K-20 camera) in a trimetrogon mounting for photo-mapping and two Fairchild K-38 cameras in a split vertical mounting with the cameras mounted horizontally, shooting via a mirror angled at 45° to reduce the effects of airframe vibrations. All gun armament was removed and the cameras installed in the gun and ammunition bays covered by a bulged fairing under the forward fuselage. The selected pilots trained on the F-100A at Edwards Air Force Base and George Air Force Base in California and then at Palmdale Air Force Base for training with the actual RF-100As they would be deployed with. Flight tests revealed that the RF-100A in its intended operational fit of four external tanks was lacking in directional and longitudinal stability, requiring careful handling and close attention to speed limitations for the drop tanks. Once pilot training was completed in April 1955, three aircraft were deployed to Bitburg Air Base in Germany, flying to Brookley AFB in Mobile, Alabama, cocooned, loaded on an aircraft carrier and delivered to Short Brothers at Sydenham, Belfast, for re-assembly and preparation for flight. At Bitburg they were allocated to Detachment 1 of the 7407th Support Squadron, and commenced operations flying over Eastern Bloc countries at high altitude (over 50,000 ft) to acquire intelligence on military targets. Many attempts were made to intercept these aircraft to no avail, with some photos of fighter airfields clearly showing aircraft climbing for attempted intercepts. The European detachment probably only carried out six missions between mid-1955 and mid-1956 when the Lockheed U-2 took over as the deep penetration aerial reconnaissance asset. Three RF-100As were also deployed to the 6021st Reconnaissance Squadron at Yokota Air Base in Japan, but details of operations there are not available. Two RF-100A aircraft were lost in accidents, one due to probable overspeeding which caused the separation of one of the drop tanks and resulted in complete loss of control, and the other due to an engine flame-out. In mid-1958, all four remaining RF-100As were returned to the US and later supplied to the Republic of China Air Force in Taiwan. F-100D Super Sabre delivering Napalm, military exercise. "High Wire" was a modernization program for selected F-100Cs, Ds and Fs. It comprised two modifications: an electrical rewiring upgrade, and a heavy maintenance and IRAN (inspect and repair as necessary) upgrade. Rewiring upgrade operations consisted of replacing old wiring and harnesses with improved maintainable designs. Heavy maintenance and IRAN included new kits, modifications, standardized configurations, repairs, replacements and complete refurbishment. This project required all new manuals and incremented (i.e. -85 to -86) block numbers. All later production models, especially the F models, included earlier High Wire modifications. New manuals included colored illustrations and had the Roman numeral (I) added after the aircraft number (i.e. T.O. 1F-100D(I)-1S-120, 12 January 1970). On 16 April 1961, six Super Sabres were deployed from Clark Air Base in the Philippines to Don Muang Royal Thai Air Force Base in Thailand for air defense purposes; the first F-100s to enter combat in Southeast Asia. From that date until their redeployment in 1971, the F-100s were the longest serving U.S. jet fighter-bomber to fight in the Vietnam War. Serving as MiG combat air patrol escorts for F-105 Thunderchiefs, Misty FACs, and wild weasels over North Vietnam, and then relegated to close air support and ground attacks within South Vietnam. On 18 August 1964, the first F-100D shot down by ground fire, piloted by 1st Lt Colin A. Clarke, of the 428th TFS; Clarke ejected and survived. On 4 April 1965, as escorts protecting F-105s attacking the Thanh Hoa Bridge, F-100 Super Sabres fought the USAF's first air-to-air jet combat duel in the Vietnam War, in which an F-100 piloted by Captain Donald W. Kilgus of the 416th Fighter Squadron shot down a Vietnam People's Air Force MiG-17, using cannon fire, while another fired AIM-9 Sidewinder missiles. The surviving North Vietnamese pilot confirmed three of the MiG-17s had been shot down. Although recorded by the U.S. Air Force as a probable kill, this represented the first aerial victory by the U.S. Air Force in Vietnam. However, the small force of four MiG-17s had penetrated the escorting F-100s to claim two F-105s. The F-100 was soon replaced by the F-4C for MiG CAP which pilots noted suffered for lacking built-in guns for dogfights. The Vietnam War was not known for utilizing activated Army National Guard, Air National Guard or other U.S. Reserve units; but rather, had a reputation for conscription during the course of the war. 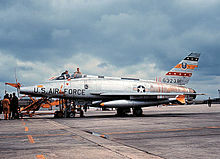 During a confirmation hearing before Congress in 1973, USAF general, George S. Brown, who had commanded the 7th Air Force during the war, stated that five of the best Super Sabre squadrons in Vietnam were from the ANG. This included the (120 TFS) of the Colorado Air National Guard, the 136 TFS of the New York Air National Guard TFS, the 174 TFS of the Iowa Air National Guard and the 188 TFS of the New Mexico Air National Guard. The fifth unit was a regular AF squadron manned by mostly air national guardsmen. The Hun was also deployed as a two-seat F-100F model which saw service as a "fast FAC" or Misty FAC in South Vietnam and Laos, spotting targets for other fighter-bomber aircraft, performing road reconnaissance, and conducting SAR (search and rescue) missions as part of the top-secret project, Commando Sabre, based out of Phu Cat and Tuy Hoa air bases. The F-100 was also the first Wild Weasel SEAD (air defense suppression) aircraft, whose specially trained crews were tasked with locating and destroying enemy air defenses. Four F-100F Wild Weasel Is were fitted with an APR-25 vector radar homing and warning (RHAW) receiver, IR-133 panoramic receivers with greater detection range, and KA-60 panoramic cameras. The APR-25 could detect early-warning radars and emissions from SA-2 Guideline tracking and guidance systems. These aircraft deployed to Korat Royal Thai Air Force Base, Thailand, in November 1965, began flying combat missions with the 388th Tactical Fighter Wing in December. They were joined by three more aircraft in February 1966. All Wild Weasel F-100Fs were eventually modified to fire the AGM-45 Shrike anti-radiation missile. F-100D 54-2122 (the second receipt by the French Air Force) with the colors of the 3/11 "Corsica" at Toul-Rosières Air Base in June 1970. French Air Force Super Sabres might have flown combat missions, with strikes flown from bases within France against targets in Algeria. The planes were based at Reims, refuelling at Istres on the return flight from attacking targets in Algeria. The F-100 was the main fighter-bomber in the French Air Force during the 1960s, until it was replaced by the Jaguar. Taiwan took delivery of 119 F-100As, 4 RF-100As and 14 F-100Fs and lost a number of F-100As and Fs in the course of service, but never lost a single RF-100As in either combat or accident. Those four RF-100As had never been sent on reconnaissance mission over mainland China as they could only produce photographic images of mediocre quality at best. Moreover, after each flying hour, the ground personnel had to spend over hundred hours on the aircraft maintenance. All of the RF-100As were returned to the US after one year and 11 months (1 January 1959 - 1 December 1960) in ROCAF service. An F-100D of the United States Air Force Thunderbirds on display at the National Museum of the United States Air Force. The first operational aircraft in United States Air Force inventory capable of exceeding the speed of sound in level flight. On 29 October 1953, the first YF-100A prototype set a world speed record of 755.149 mph (656.207 kn, 1,215.295 km/h) at low altitude. On 20 August 1955, an F-100C set a supersonic world speed record of 822.135 mph (714.416 kn, 1,323.098 km/h). On 4 September 1955, an F-100C won the Bendix Trophy, covering 2,235 mi (2,020 nmi, 3,745 km) at an average speed of 610.726 mph (530.706 kn, 982.868 km/h). On 26 December 1956, two F-100Ds became the first-ever aircraft to successfully perform buddy refueling. On 13 May 1957, three F-100Cs set a new world distance record for single-engine aircraft by covering the 6,710 mi (5,835 nmi, 10,805 km) distance from London to Los Angeles in 14 hours and 4 minutes. The flight was accomplished using inflight refueling. On 7 August 1959, two F-100Fs became the first-ever jet fighters to fly over the North Pole. On 16 April 1961, the first USAF combat jets to enter the Vietnam War. 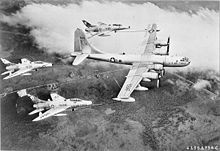 On 4 April 1965, the first USAF aircraft to engage in aerial jet combat during the Vietnam War, while escorting F-105 Thunderchiefs to target. The United States Air Force Thunderbirds operated the F-100C from 1956 until 1964. After briefly converting to the F-105 Thunderchief, the team flew F-100Ds from July 1964 until November 1968, before converting to the F-4E Phantom II. The costs are in contemporary United States dollars and have not been adjusted for inflation. A QF-100D pilotless drone near Tyndall Air Force Base, Florida, in 1986. Prototype, model NA-180 two built, s/n 52-5754 and 5755. Nine test unmanned drone version: two D-models, one YQF-100F F-model,see DF-100F, and six other test versions. Single-seat day fighter; 203 built, model NA-192. Six F-100A aircraft modified for photo reconnaissance in 1954. Unarmed, with camera installations in lower fuselage bay. Used for overflights of Soviet Bloc countries in Europe and the Far-East. Retired from USAF service in 1958, the surviving four aircraft were transferred to the Republic of China Air Force and retired in 1960. Proposed interceptor version of F-100B, did not advance beyond mock-up. Seventy Model NA-214 and 381 Model NA-217. Additional fuel tanks in the wings, fighter-bomber capability, probe-and-drogue refueling capability, uprated J57-P-21 engine on late production aircraft. First flight: March 1954; 476 built. One F-100C converted into a two-seat training aircraft. Single-seat fighter-bomber, more advanced avionics, larger wing and tail fin, landing flaps. First flight: 24 January 1956; 1,274 built. Two-seat training version, armament decreased from four to two cannon. First flight: 7 March 1957; 339 built. This designation was given to one F-100F that was used as drone director. Three F-100Fs used for test purposes, the prefix "N" indicates that modifications prevented return to regular operational service. Specific Danish designation given to 14 F-100Fs exported to Denmark in 1974, in order to distinguish these from the 10 F-100Fs delivered 1959–1961. Another 209 D and F models were ordered and converted to unmanned radio-controlled FSAT (full scale aerial target) drone and drone directors for testing and destruction by modern air-to-air missiles used by current U.S. Air Force fighter jets. Flyvevåbnet operated a total of 72 aircraft. 48 F-100Ds and 10 Fs were delivered to Denmark from 1959 to 1961 as MDAP equipment. The F-100 replaced the F-84G Thunderjet as a strike fighter in three squadrons; 725, 727 and 730. The F-100s of Eskadrille 725 were replaced by Saab F-35 Draken in 1970 and in 1974 14 two-seated ex-USAF TF-100F were bought. The last Danish F-100s were retired from service in 1982, replaced by F-16s. The surviving MDAP F-100s were transferred to Turkey (21 F-100Ds and two F-100Fs), while six TF-100Fs were sold for target towing. The Armee de l'Air was the first Western-aligned air force to receive the F-100 Super Sabre. The first aircraft arrived in France on 1 May 1958. A total of 100 aircraft (85 F-100Ds and 15 F-100Fs) were supplied to France, and assigned to the NATO 4th Allied Tactical Air Force. They were stationed at German-French bases. French F-100s were used on combat missions flying from bases in France against targets in Algeria. In 1967, France left NATO, and German-based F-100s were transferred to France, using bases vacated by the USAF. 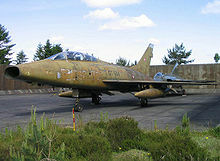 The last unit on F100D/F was the Escadron 4/11 Jura, based at Djibouti, which kept the Super Sabre until 1978. It was the only allied air force to operate the F-100A model. The first F-100 was delivered in October 1958. It was followed by 15 F-100As in 1959, and by 65 more F-100As in 1960. In 1961, four unarmed RF-100As were delivered. Additionally, 38 ex-USAF/Air National Guard F-100As were delivered later, to bring the total strength to 118 F-100As and four RF-100As. F-100As were retrofitted with the F-100D vertical tail with its AN/APS-54 tail-warning radar and equipped to launch Sidewinder air-to-air missiles. Several were lost in intelligence missions over the People's Republic of China. The Turk Hava Kuvvetleri received 206 F-100C, D and F Super Sabres. Most came from USAF stocks, and 21 F-100Ds and two F-100Fs were supplied by Denmark. Turkish F-100s saw extensive action during the 1974 military operation against Cyprus. 55-2736 – Musée de l'Air et de l'Espace, Paris / Le Bourget. 54-2136 French Air Force – Schwäbisches Bauern Technical Museum, Eschach-Seifertshofen. 54-2185 French Air Force – Schwäbisches Bauern Technical Museum, Eschach-Seifertshofen. 56-3944 United States Air Force – Flugausstellung Leo Junior, Hermeskeil. 54-2265 - (painted as 54-1871, 32nd FIS) – On display at the Nationaal Militair Museum, Soesterberg. After service with the French Air Force it was returned to USAF, repainted in USAF markings and in 1976 to gate guardian at RAF Wethersfield, England. It was then removed 20 January 1988 and reported at the time to be destined for AMARC, to be held in storage on behalf of USAFM (now NMUSAF). 53-1550 – Taiwan International (Chiang Kai Shek). 53-1577 – National Tainan Industrial Vocational High School Aircraft Maintenance Department. 53-1589 – National Taiwan University. 53-1696 – Chung Cheng Armed Forces Preparatory School, CCAFPS. 54-2009/3-089 – Istanbul Aviation Museum, Istanbul. 54-2245/E-245 – Istanbul Aviation Museum, Istanbul. 56-3788/8-788 – Istanbul Aviation Museum, Istanbul. 54-2157 – North East Aircraft Museum, Sunderland. 54-2174 – Midland Air Museum, Coventry. 54-2196 – Norfolk and Suffolk Aviation Museum, Bungay. 54-2223 – Newark Air Museum, Newark-on-Trent. 54-2613 – Dumfries and Galloway Aviation Museum, Dumfries. 56-3938 French Air Force – Lashenden Air Warfare Museum, Ashford where an aircraft accident at the museum damaged 938 and the remains were shipped to the National Museum of the United States Air Force at Wright-Patterson AFB in Dayton, Ohio, United States. 56-3842 – Big Sky Warbirds LCC in Belgrade, Montana. 56-3844 – Collings Foundation in Stow, Massachusetts. 56-3916 – Big Sky Warbirds LCC in Belgrade, Montana. 56-3948 – American Horizons Ltd. Inc. in Fort Wayne, Indiana. 56-3971 – Big Sky Warbirds LCC in Belgrade, Montana. 56-3996 – Big Sky Warbirds LCC in Belgrade, Montana. 52-5755 – Century Circle, West Gate at Air Force Flight Test Center Museum, Edwards AFB, California. 52-5759 – USAF History and Traditions Museum, Lackland AFB, Texas. 52-5760 – Museum Desert Storate, Air Force Flight Test Center Museum, Edwards AFB, California. 52-5761 – New England Air Museum, Bradley International Airport, Connecticut. 52-5762 – Grand Haven Memorial Airpark, Grand Haven, Michigan. 52-5770 – Travis AFB Heritage Center, Vacaville, California. 52-5773 – Commemorative Air Force Headquarters, Midland, Texas. 52-5777 – Hill Aerospace Museum, Hill AFB, Utah. 53-1532 – 150th Special Operations Wing, New Mexico Air National Guard area, Kirtland AFB, Albuquerque, New Mexico. 53-1533 – Baxter Memorial Park, Melrose, New Mexico. 53-1553 – South Dakota Air and Space Museum, Rapid City, South Dakota. 53-1559 – 178th Fighter Wing / Springfield-Beckley Municipal Airport, Springfield, Ohio. 53-1573 – Seymour Johnson AFB, North Carolina. 53-1578 – 140th Fighter Wing / Colorado Air National Guard compound, Buckley AFB, Aurora, Colorado. 53-1600 – Tucumcari Historical Museum, Tucumcari, New Mexico. 53-1629 – Ebing Air National Guard Base – 188th Fighter Wing, Fort Smith, Arkansas. 53-1684 – Historic Aviation Memorial Museum, Tyler, Texas. 53-1688 – stored for Raytheon at the Mojave Airport, Mojave, California. 53-1712 – Grissom Air Museum, Grissom ARB (former Grissom AFB), Peru, Indiana. 53-1716 – Luke Air Force Base Air Park, Luke AFB, Phoenix, Arizona. 54-1748 – Holt Heritage Airpark, Mountain Home AFB, Boise, Idaho. 54-1752 – Dyess Linear Air Park, Dyess AFB, Texas. 54-1753 – Southern Museum of Flight, Birmingham, Alabama. 54-1784 – Prairie Aviation Museum, Bloomington, Illinois. Formerly at Octave Chanute Aerospace Museum, former Chanute AFB, Rantoul, Illinois. 54-1786 – March Field Air Museum, March ARB (former March AFB), Riverside, California. 54-1823 – Pima Air & Space Museum (adjacent to Davis-Monthan AFB), Tucson, Arizona. 54-1986 (painted as F-100C 54-1954 as flown by former northwest Florida resident and Medal of Honor recipient, Colonel George Bud Day, USAF Ret Dec) – Air Force Armament Museum, Eglin AFB, Florida. 54-1993 – Freedom Historical Air Park, McConnell AFB, Wichita, Kansas. 54-2005 – 185th Air Refueling Wing / Sioux City Air National Guard Base, Sioux Gateway Airport, Sioux City, Iowa. 54-2091 – Yanks Air Museum, Chino, California. 54-2106 – Volk Field Air National Guard Base, Wisconsin. F-100D on display at Sheppard AFB. 54-2145 – Air Power Park near Langley AFB in Hampton, Virginia. 54-2151 – Sheppard AFB Air Park, Sheppard AFB, Texas. 55-2855 – Toledo ANGB, Toledo Express Airport, Toledo, Ohio. 55-2884 – 121st Air Refueling Wing / Rickenbacker ANGB, Columbus, Ohio. 55-3503 – Pueblo Weisbrod Aircraft Museum, Pueblo, Colorado. 55-3595 – Nellis AFB, Nevada. 55-3650 – 180th Fighter Wing / Toledo Air National Guard Base, Swanton, Ohio. 55-3667 – Missouri Air National Guard / Whiteman Air Force Base, Knob Noster, Missouri. 55-3678 – Maxwell AFB Air Park, Maxwell AFB, Alabama. 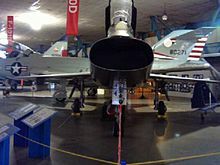 55-3754 – National Museum of the United States Air Force, Wright-Patterson AFB, Ohio. 55-3805 – Connecticut ANGB – 103d Airlift Wing area, Windsor Locks, Connecticut. 56-2928 – Dobbins ARB, Marietta, Georgia. 56-2940 – Cannon AFB, New Mexico. 56-2967 – Myrtle Beach, South Carolina. 56-2993 – New York ANGB – 107th Airlift Wing area, Niagara Falls, New York. 56-2995 – Massachusetts ANGB – 102nd Intelligence Wing compound, Otis ANGB, Falmouth, Massachusetts. 56-3000 – Lackland AFB / Kelly Field Annex (former Kelly AFB) – 149th Fighter Wing area, San Antonio, Texas. 56-3008 – Massachusetts ANGB – 104th Fighter Wing complex, Westfield, Massachusetts. 56-3020 – NAS JRB New Orleans, 159th Fighter Wing area, New Orleans, Louisiana. 56-3022 – Mansfield Lahm ANGB – 179th Airlift Wing area, Mansfield, Ohio. 56-3025 – Selfridge Military Air Museum, Mount Clemens, Michigan. 56-3046 – Randall County Veterans Park, Amarillo, Texas. 56-3055 – Tucson Air National Guard Base - 162nd Fighter Wing complex, Tucson, Arizona. 56-3081 – MAPS Air Museum, Akron/Canton Airport Ohio. 56-3141 – Planes of Fame, Chino, California. 56-3154 – Lone Star Flight Museum, Galveston, Texas. 56-3187 – Sioux Falls ANGB – 114th FG, Sioux Falls, South Dakota. 56-3208 – Fessenden, North Dakota. 56-3220 – Holloman AFB, New Mexico. 56-3288 – Aerospace Museum of California, Sacramento, California. 56-3299 – Buckley AFB – 140th Fighter Wing area, Aurora, Colorado. 56-3320 – Terre Haute ANGB – 181st Fighter Wing area, Terre Haute, Indiana. 56-3417 – Wings Over the Rockies Air and Space Museum (former Lowry AFB), Denver, Colorado. 56-3426 – Des Moines ANGB – 132nd Fighter Wing area, Des Moines, Iowa. 56-3434 – Previously at Arkansas National Guard HQ, Little Rock, Arkansas. relocated to Valiant Air Command Warbird Museum, Space Coast Regional Airport, Titusville, Florida in 2015 for restoration. 56-3440 – Steven F. Udvar-Hazy Center, Fairfax County, Virginia. 56-3727 – Warrior Park, Davis-Monthan AFB, Arizona. 56-3730 – USAF Academy, Colorado. 56-3812 – Veterans Park, Duncan, Arizona. 56-3814 – Bay Street Park, Texas City, Texas. 56-3819 – Saint Maries Municipal Airport, Saint Maries, Idaho. 56-3822 – Clay County Veterans Memorial Park, Lineville, Alabama. 56-3825 – Aurora Municipal Airport, Aurora, Nebraska. 56-3832 – Evergreen Aviation and Space Museum, McMinnville, Oregon. 56-3837 – National Museum of the United States Air Force, Wright-Patterson AFB, Ohio. 56-3855 – Las Cruces Municipal Airport, Las Cruces, New Mexico. 56-3897 – Atlantic City ANGB – 177th Fighter Wing complex, Atlantic City, New Jersey. 56-3894 – Selfridge Military Air Museum, Selfridge Air National Guard Base, Mount Clemens, Michigan. 56-3899 – Glenn L. Martin Aviation Museum, Middle River, Maryland. 56-3904 – Aviation Cadet Museum, Silver Wings Field, Eureka Springs, Arkansas. 56-3905 – Glenn L. Martin Aviation Museum, Middle River, Maryland. 56-3929 – Fayette Regional Air Center Airport, La Grange, Texas. 56-3982 – Hangar 25 Air Museum, Big Spring, Texas. 56-3990 – Commemorative Air Force – Highland Lakes Squadron, Burnet, Texas. ^ "Historical Listings: China, Nationalist (Taiwan) (NCH)." Archived 10 June 2011 at the Wayback Machine World Air Forces. Retrieved: 19 May 2011. ^ a b c d e f Knaack, Marcelle Size. Encyclopedia of U.S. Air Force Aircraft and Missile Systems: Volume 1 Post-World War II Fighters 1945–1973. Washington, DC: Office of Air Force History, 1978. ISBN 0-912799-59-5. ^ Rendall, Ivan (1999). Rolling Thunder: jet combat from World War II to the Gulf War (First U.S. ed.). New York: Simon & Shuster Inc. p. 110. ISBN 0-684-85780-4. ^ "North American F-100C "Super Sabre"". fas.org. 29 June 1999. Retrieved 23 July 2017. ^ "A-7 Corsair II". globalsecurity.org. Retrieved 23 July 2017. ^ "F-100 Super Sabre; Historical Snapshot". Boeing.com. Retrieved 23 July 2017. ^ "Production Fighter Tops Speed of Sound." Popular Mechanics, December 1953, p. 81. ^ Playground News, Aug. 26, 1954, "6 F-100s At Eglin For Test." ^ "North American Aviation NF-100D (56-2904)". thexhunters.com. Retrieved 23 July 2017. ^ Davis, Jim (20 May 2008). "1958 F-100 Uses Short "Runway"". YouTube. Retrieved 23 July 2017. ^ Martin Caidin's book Thunderbirds was written while the team flew F-100s, he was the only journalist to ever fly with them. ^ a b "Official USAF F-100 accident rate table (PDF)." Archived 22 July 2011 at the Wayback Machine afsc.af.mil. Retrieved: 12 April 2011. ^ Gordon, Doug. “Through the Curtain”. Flypast, December 2009. Key Publishing. Stamford. ISSN 0262-6950. ^ USAF F-100 Super Sabre – Flight Manual – Technical Order: 1F-100D(I)-1S-120; 12 January 1970. ^ USAF F-100 Super Sabre – Flight Manual – Technical Order: 1F-100C(I)-1S-65; 2 February 1971. ^ Anderton 1987, p. 57. ^ Davies and Menard 2011, cover image of F-100 attacking MiG-17, p. 21: photo of Kilgus's F-100. ^ Toperczer, Dr. Istvan. Air War Over North Viet Nam: The Vietnamese People's Air Force 1949–1977. Carrollton, Texas: Squadron/Signal Publications, 1998. ISBN 0-89747-390-6. ^ Dorr, Robert F. (18 April 2014). "F-100 Versus MiG-17: The Air Battle Nobody Told You About". defensemedianetwork.com. Retrieved 23 July 2017. ^ Anderton 1987, p. 71. ^ Anderton 1987, p. 136. ^ Anderton 1987, p. 144. ^ Anderton 1987, pp. 136, 145. ^ Thompson 2008, pp. 73–74. ^ Dorr, Robert F. (12 September 2013). "F-100 Super Sabre Flew Most Missions in Vietnam". defensemedianetwork.com. Retrieved 23 July 2017. ^ a b c Thompson 1999, p. 64. ^ a b c Baugher, Joe. "QF-100 Drone." USAAC/USAAF/USAF Fighters, 30 January 2010. Retrieved: 12 April 2011. ^ Gustin, Emmanuel. "Acronyms and Codenames FAQ, FSAT". hazegray.org. Retrieved 23 July 2017. ^ "North American RF-100A Super Sabre". joebaugher.com. 27 November 1999. Retrieved 23 July 2017. ^ "F-100 Super Sabre/55-2736." Archived 25 March 2016 at the Wayback Machine Virtual Aviation Museum. Retrieved: 7 March 2013. ^ "F-100F on Display." Archived 25 March 2016 at the Wayback Machine Virtual Aviation Museum. Retrieved: 4 September 2009. ^ "F-100 Super Sabre/54-2185." Archived 25 March 2016 at the Wayback Machine Virtual Aviation Museum. Retrieved: 7 March 2013. ^ "F-100 Super Sabre/56-3944." Archived 25 March 2016 at the Wayback Machine Virtual Aviation Museum. Retrieved: 4 September 2009. ^ "F-100 Super Sabre/54-2265." nmm.nl. Retrieved: 14 October 2017. ^ "F-100 Super Sabre/53-1550." airliners.net. Retrieved: 7 March 2013. ^ "F-100 Super Sabre/53-1571." airliners.net. Retrieved: 7 March 2013. ^ " Retrieved: 7 March 2013. ^ "F-100 Super Sabre/53-1589." airliners.net Retrieved: 7 March 2013. ^ "F-100 Super Sabre/53-1696." airliners.net. Retrieved: 7 March 2013. ^ "F-100 Super Sabre/54-2009/3-089". tayyareci.com. Retrieved: 12 March 2011. ^ "F-100 Super Sabre/54-2245/E-245". tayyareci.com. Retrieved: 12 March 2011. ^ "F-100 Super Sabre/56-3788/8-788". tayyareci.com. Retrieved: 12 March 2011. ^ "F-100 Super Sabre/54-2157." North East Aircraft Museum. Retrieved: 16 June 2013. ^ "F-100 Super Sabre/54-2165." Imperial War Museum Duxford Retrieved: 23 July 2017. ^ "F-100 Super Sabre/54-2174." Midland Air Museum. Retrieved: 23 July 2017. ^ "F-100 Super Sabre/54-2196." Norfolk and Suffolk Aviation Museum. Retrieved: 23 July 2017. ^ "F-100 Super Sabre/54-2223." Newark Air Museum. Retrieved: 23 July 2017. ^ "F-100 Super Sabre/54-2613." Dumfries and Galloway Aviation Museum. Retrieved: 23 July 2017. ^ "F-100 Super Sabre/56-3938." Lashendene Air Warfare Museum. Retrieved: 23 July 2017. ^ "FAA Registry: N417FS." faa.gov Retrieved: 6 March 2016. ^ "FAA Registry: N26AZ." faa.gov Retrieved: 7 March 2013. ^ "F-100 Super Sabre/56-3844." Collings Foundation Retrieved: 12 June 2015. ^ "FAA Registry: N416FS." faa.gov Retrieved: 6 March 2016. ^ "FAA Registry: N2011V." faa.gov Retrieved: 6 March 2016. ^ "FAA Registry: N419FS." faa.gov Retrieved: 6 March 2016. ^ "FAA Registry: N418FS." faa.gov Retrieved: 6 March 2016. ^ "F-100 Super Sabre/52-5755." Air Force Flight Test Museum. Retrieved: 1 June 2015. ^ "F-100 Super Sabre/52-5759." aerialvisuals.ca Retrieved: 23 July 2017. ^ "F-100 Super Sabre/52-5760." Air Force Flight Test Museum. Retrieved: 1 June 2015. ^ "F-100 Super Sabre/52-5761." New England Air Museum. Retrieved: 23 July 2017. ^ "F-100 Super Sabre/52-5762. aerialvisuals.ca Retrieved: 23 July 2017. ^ "F-100 Super Sabre/52-5770." aerialvisuals.ca Retrieved: 23 July 2017. ^ "F-100 Super Sabre/52-5773." aerialvisuals.ca Retrieved: 23 July 2017. ^ "F-100 Super Sabre/52-5777." Hill Aerospace Museum. Retrieved: 23 July 2017. ^ "F-100 Super Sabre/53-1532." aerialvisuals.ca Retrieved: 23 July 2017. ^ "F-100 Super Sabre/53-1533." aerialvisuals.ca Retrieved: 23 July 2017. ^ "F-100 Super Sabre/53-1553." aerialvisuals.ca Retrieved: 23 July 2017. ^ "F-100 Super Sabre/53-1559." aerialvisuals.ca Retrieved: 23 July 2017. ^ "F-100 Super Sabre/53-1573." aerialvisuals.ca Retrieved: 23 July 2017. ^ "F-100 Super Sabre/53-1578." aerialvisuals.ca Retrieved: 23 July 2017. ^ "F-100 Super Sabre/53-1600." aerialvisuals.ca Retrieved: 12 June 2015. ^ "F-100 Super Sabre/53-1629." aerialvisuals.ca Retrieved: 12 June 2015. ^ "F-100 Super Sabre/53-1684." aerialvisuals.ca Retrieved: 12 June 2015. ^ "F-100 Super Sabre/53-1688." aerialvisuals.ca Retrieved: 12 June 2015. ^ "F-100 Super Sabre/53-1709." Castle AFB Retrieved: 23 July 2017. ^ "F-100 Super Sabre/53-1712." Grissom Air Museum. Retrieved: 5 March 2013. ^ "F-100 Super Sabre/53-1716." aerialvisuals.ca Retrieved: 1 June 2015. ^ "F-100 Super Sabre/54-1748." aerialvisuals.ca Retrieved: 12 June 2015. ^ "F-100 Super Sabre/54-1752." aerialvisuals.ca Retrieved: 1 June 2015. ^ "F-100 Super Sabre/54-1753." aerialvisuals.ca Retrieved: 1 June 2015. ^ "USAF Serial Number Search (54-1784)". Retrieved 14 February 2018. ^ "Prairie Aviation Museum (F-100)". Retrieved 1 March 2018. ^ "USAF Serial Number Search (54-1785)". Retrieved 14 February 2018. ^ "F-100 Super Sabre/54-1786." March Field Museum. Retrieved: 23 July 2017. ^ "F-100 Super Sabre/54-1823." Pima Air & Space Museum. Retrieved: 23 July 2017. ^ "F-100 Super Sabre/54-1986." Air Force Armament Museum. Retrieved: 23 July 2017. ^ "F-100 Super Sabre/54-1993." aerialvisuals.ca Retrieved: 1 June 2015. ^ "F-100 Super Sabre/54-2005." aerialvisuals.ca Retrieved: 1 June 2015. ^ "F-100 Super Sabre/54-2091." Yanks Air Museum. Retrieved: 5 March 2013. ^ "FAA Registry: N2011M." faa.gov Retrieved: 22 October 2018. ^ "F-100 Super Sabre/54-2106." aerialvisuals.ca Retrieved: 1 June 2015. ^ "F-100 Super Sabre/54-2145." aerialvisuals.ca Retrieved: 1 June 2015. ^ "F-100 Super Sabre/54-2151." aerialvisuals.ca Retrieved: 1 June 2015. ^ "F-100 Super Sabre/54-2281." City of Glendale, Arizona. Retrieved: 2 November 2013. ^ "F-100 Super Sabre/54-2299." City of Palmdale, California. Retrieved: 23 July 2017. ^ "F-100 Super Sabre/55-2855." aerialvisuals.ca Retrieved: 12 June 2015. ^ "F-100 Super Sabre/55-2884." aerialvisuals.ca Retrieved: 1 June 2015. ^ "F-100 Super Sabre/55-3503." Archived 30 October 2013 at the Wayback Machine Pueblo Weisbrod Aircraft Museum. Retrieved: 6 March 2013. ^ "F-100 Super Sabre/55-3595." aerialvisuals.ca Retrieved: 1 June 2015. ^ "F-100 Super Sabre/55-3650." aerialvisuals.ca Retrieved: 1 June 2015. ^ "F-100 Super Sabre/55-3667." aerialvisuals.ca Retrieved: 1 June 2015. ^ "F-100 Super Sabre/55-3678." aerialvisuals.ca Retrieved: 1 June 2015. ^ "F-100 Super Sabre/55-3754." National Museum of the USAF. Retrieved: 16 July 2017. ^ "F-100 Super Sabre/55-3805." aerialvisuals.ca Retrieved: 1 June 2015. ^ "F-100 Super Sabre/56-2928." aerialvisuals.ca Retrieved: 1 June 2015. ^ "F-100 Super Sabre/56-2940." aerialvisuals.ca Retrieved: 1 June 2015. ^ "F-100 Super Sabre/56-2967." aerialvisuals.ca Retrieved: 12 June 2015. ^ "F-100 Super Sabre/56-2993." aerialvisuals.ca Retrieved: 1 June 2015. ^ "F-100 Super Sabre/56-2995." aerialvisuals.ca Retrieved: 1 June 2015. ^ "F-100 Super Sabre/56-3000." aerialvisuals.ca Retrieved: 1 June 2015. ^ "F-100 Super Sabre/56-3008." aerialvisuals.ca Retrieved: 1 June 2015. ^ "F-100 Super Sabre/56-3020." aerialvisuals.ca Retrieved: 1 June 2015. ^ "F-100 Super Sabre/56-3022." aerialvisuals.ca Retrieved: 12 June 2015. ^ "F-100 Super Sabre/56-3025." Selfridge Military Air Museum. Retrieved: 12 June 2015. ^ "F-100 Super Sabre/56-3046." aerialvisuals.ca Retrieved: 12 June 2015. ^ "F-100 Super Sabre/56-3055." aerialvisuals.ca Retrieved : 1 June 2015. ^ "F-100 Super Sabre/56-3081." MAPS Air Museum. Retrieved: 6 March 2013. ^ "F-100 Super Sabre/56-3141." Planes of Fame. Retrieved: 12 June 2015. ^ "F-100 Super Sabre/56-3154." Archived 30 June 2013 at the Wayback Machine Lone Star Flight Museum. Retrieved: 6 March 2013. ^ "F-100 Super Sabre/56-3187." aerialvisuals.ca Retrieved: 1 June 2015. ^ "F-100 Super Sabre/56-3208." aerialvisuals.ca Retrieved: 12 June 2015. ^ "F-100 Super Sabre/56-3220." aerialvisuals.ca Retrieved: 1 June 2015. ^ "F-100D Super Sabre/56-3288." Aerospace Museum of California. Retrieved: 23 July 2017. ^ "F-100 Super Sabre/56-3299." aerialvisuals.ca Retrieved: 1 June 2015. ^ "F-100 Super Sabre/56-3320." aerialvisuals.ca Retrieved: 1 June 2015. ^ "F-100 Super Sabre/56-3417." Wings Over the Rockies Museum. Retrieved: 23 July 2017. ^ "F-100 Super Sabre/56-3426." aerialvisuals.ca Retrieved: 1 June 2015. ^ "F-100 Super Sabre/56-3440." Steven F. Udvar-Hazy Center Retrieved: 23 July 2017. ^ "F-100 Super Sabre/56-3727." aerialvisuals.ca Retrieved: 1 June 2015. ^ "F-100 Super Sabre/56-3730." aerialvisuals.ca Retrieved: 1 June 2015. ^ "F-100 Super Sabre/56-3812." aerialvisuals.ca Retrieved: 12 June 2015. ^ "F-100 Super Sabre/56-3813." aerialvisuals.ca Retrieved: 1 June 2015. ^ "F-100 Super Sabre/56-3814." aerialvisuals.ca Retrieved: 12 June 2015. ^ "F-100 Super Sabre/56-3819." aerialvisuals.ca Retrieved: 12 June 2015. ^ "F-100 Super Sabre/56-3825." aerialvisuals.ca Retrieved: 12 June 2015. ^ "F-100 Super Sabre/56-3832." Archived 30 June 2017 at the Wayback Machine Evergreen Aviation and Space Museum. Retrieved: 23 July 2017. ^ "North American F-100F Super Sabre." National Museum of the USAF. Retrieved: 12 September 2015. ^ "F-100 Super Sabre/56-3855." aerialvisuals.ca Retrieved: 12 June 2015. ^ "F-100 Super Sabre/56-3897." aerialvisuals.ca Retrieved: 1 June 2015. ^ "F-100 Super Sabre/56-3894." Selfridge Military Air Museum. Retrieved: 12 June 2015. ^ "F-100 Super Sabre/56-3899." Glenn L. Martin Aviation Museum. Retrieved: 1 June 2015. ^ "F-100 Super Sabre/56-3904." Aviation Cadet Museum. Retrieved: 23 July 2017. ^ "F-100 Super Sabre/56-3905." Glenn L. Martin Aviation Museum. Retrieved: 1 June 2015. ^ "F-100 Super Sabre/56-3929." aerialvisuals.ca Retrieved: 12 June 2015. ^ "F-100 Super Sabre/56-3982." Hangar 25 Air Museum. Retrieved: 23 July 2017. ^ "F-100 Super Sabre/56-3990." Archived 26 April 2015 at the Wayback Machine CAF – Highland Lakes Squadron. Retrieved: 12 June 2015. ^ Loftin, L.K. Jr. Quest for Performance: The Evolution of Modern Aircraft." NASA SP-468. Retrieved: 22 April 2006. ^ Rhodes, Jeffrey P. "Fighters." USAF Magazine: Archives, 20 February 1997, p. 15. Anderton, David A. North American F-100 Super Sabre. London: Osprey Publishing Limited, 1987. ISBN 0-85045-662-2 . Davies, Peter E. and David W. Menard. F-100 Super Sabre Units of the Vietnam War (Osprey Combat Aircraft, No. 89) Oxford, UK: Osprey, 2011. ISBN 978-1-84908-446-8. Hobson, Chris. Vietnam Air Losses: United States Air Force, Navy and Marine Corps Fixed-Wing Aircraft Losses in Southeast Asia, 1961–1973. North Branch, Minnesota: Specialty Press, 2001. ISBN 1-85780-115-6. 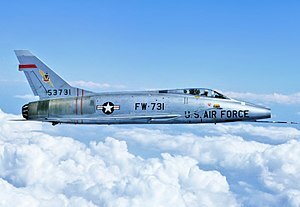 Wikimedia Commons has media related to North American F-100 Super Sabre. This page was last edited on 17 April 2019, at 07:48 (UTC).